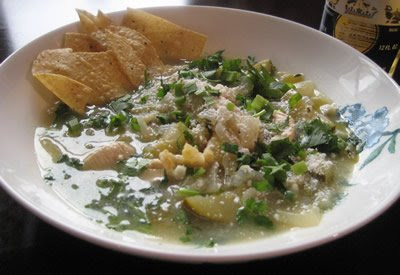 Tomatillos have a nice bright flavor that really pops when mixed with cilantro, beer, and thyme in this soup. Prepare tomatillos by removing the husks, rinsing (they’ll be sticky! ), and then chopping roughly. Chop the onion and zucchini into pieces of about the same size as the tomatillos. Seed the jalapenos by slicing them open lengthwise, then using the tip of the knife to scrape out the seeds. (Be careful not to touch the seeds with your fingers. If you happen to by mistake, then be *really* careful not to rub your eyes with your hands.) Mince the garlic. In a large pot, warm the olive oil over medium-high heat, and add the chopped produce along with the cumin, some salt, and a few grinds of black pepper. Meanwhile, slice the chicken into ½ inch wide strips and set aside. Cook the vegetables approx. 7-8 minutes, until the onion is softened and yellow, and the tomatillos become saucy. (Truly, it’s a cheeky and impertinent vegetable. You’ll see!) Add the beer to the vegetables and cook until reduced by about half, approx. 5 minutes. Add the chicken broth and thyme, cover and bring to a boil. Once boiling, remove cover, reduce heat to medium-low, add chicken and cook over a low boil for about 6 minutes. While soup is cooking, slice the scallions, chop the cilantro, and cut lime into small wedges. When the soup is ready, ladle into bowls and squeeze juice from a lime wedge into each. Allow your guests to top as they please with tortilla chips, scallions and cilantro. *I like this heavy on the cumin: goes easier on it if you’re not as rabid a fan. **If you do not like or can not find cotija cheese, feel free to substitute Monterey Jack. Watch out Campbells and other soup companies! This looks really good! I will have to try it. This looks excellent! Gave you a stumble on StumbleUpon. YUM! Oh man. My mouth started watering as soon as I saw the title of the post. And with the pictures? Excuse me as I frantically search for something even remotely similar for lunch. oh wow, i love soup and this is exactly what I need right now. it looks so colorful, perfect for spring and summer. This looks great! I love tomatillos. Most recipes I have seen puree the tomatillos in a blender/food processor. I like that you left everything chunky - I am a fan of chunky soups! 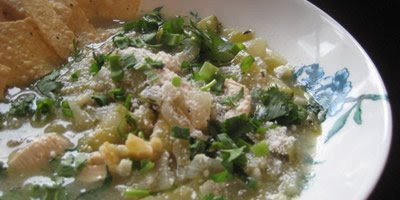 I love tomatillos, and I've never seen them in a tortilla soup before. Is there a strong beer flavor to the end result? I'm not a huge fan of the taste of most beers, but I know cooking (particularly with stuff as strong tasting as tomatillos, cumin, and cilantro) will change the flavor. This recipe looks so terrific! I love that you give the nutritional info too! That looks wonderful! I almost jump for joy when I see tomatillos finally because then I know salsa verde is coming and love that on enchiladas. I will have to try this soup, it looks wonderful! I get those same eyerolls at the store when I get excited about something cool LOL I love it! This looks delicious! I also saw tomatillos in my NYC grocery store the other day. I was excited - I'll have to try this instead of just popping them all on the grill like I usually do! Glad to see we're not the only ones excited about tomatillos! That looks amazing! I love tomatillos also. I haven't noticed any at our local stores yet but I'll definitely be watching for them now. Following Katie's lead and stumbling! i am foaming at the mouth... i'm a fan of tortilla soup... but have never had anything like your GORGEOUS GREENY soup! love the color... mmmMMM cilantro! i wonder, how well does this work in a crock pot? looks beautiful! healthy as well! the greens are gorgeous. thanks for the great recipe. that looks delicious indeed - and I never know what to do with tomatillos (not very common where I come from). Now I know. Thanks! We love tomatillos, we grow them in our yard along with the tomatoes and peppers for our salsa. I'm always on the lookout for another good tomatillo recipe, thanks. 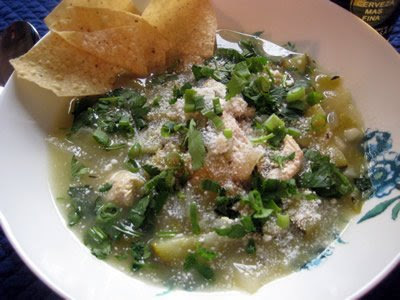 This looks great, and I love tomatillos - this looks like a much lighter fresh version of tortilla soup than I am used to seeing, I will have to try it! Great use of tomatillos. Normally I only use it in salsa, but I will have to try it in soup. Ninjapenguin: belatedly, if you're not a fan of beer, I would try this with only half a bottle. It doesn't have a strong beer taste as is, but its definitely there. Cutting the amount in half should be enough to still add some depth of flavor but without being too strong for someone who doesn't care for beer. Appropriated Muffin: we don't actually have a crockpot, so I unfortunately can't give you any guidance. If you try it and it works out, let us know! This looks really delicious... would love to taste it. This looks delish. I just printed it and will make it soon. Thanks. I made it tonight and it was fabulous and the entire family had seconds and thirds! Another rec(ession)cipe idea is to add white beans to the soup--making it last just a little longer!